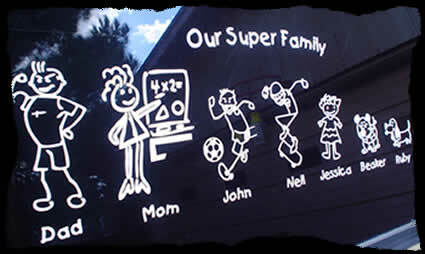 Family Stickers at FamilyStickerz.com...The Easiest place to design a Family Decal to show your Family Pride! Create it the easy way! Get your Family Sticker...Your way! ...And Fast! ZOMBIE and Monster Family Stickers! ...or order one of each style. You can cut the members apart and stick them anywhere you choose or apply it as one piece. No ugly background, just the Family Stickers figures themselves. 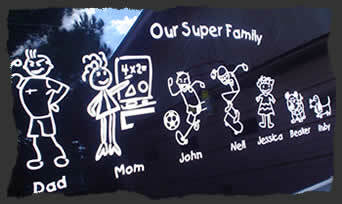 The family sticker goes on the outside of the window, or body of a vehicle. Most commonly chosen is a family sticker set with the height of the largest family person that starts at about 4.5 inches tall. The rest of the family members get smaller as they go down the family tree. You can note special size needs in the age/comments box. 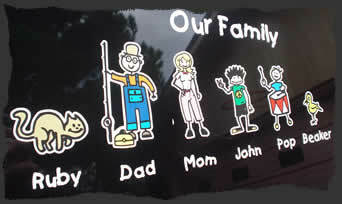 Create your own family sticker now with many family member designs to choose from. Go ahead...Give it a try, its FUN & EASY! No Boring Ordering Forms to fill out! Super EASY to use Website! 100's of Stick Figure Members! 2 different version styles: One color diecut, or a full color version! Grandparents, Dogs, cats, animals, extras too! Names or not, it's your choice! Includes Sample proof to make sure we get your order correct. ...also try the full color version here! Which Style Family Sticker do you want...? "The coolest, most affordable, cleanest looking, high quality family sticker available!" "Awesome, One of a kind look you can't get anywhere else...I love it!" Currently ( 778 ) different stick figure Members. Currently ( 778 ) different family members and different color style combinations and possibilities for each. No boring ordering forms. Fun, fast, and easy! Yes. See our feedback section for what others have to say. This VIDEO makes it super easy. Yes. See our the VIDEO all about it. With this style the decals come separate so you have to manually align each. Comes as one decal or many. This comes as one decal. You can cut it apart and apply the family members where you want to or apply as one piece. The final result is the same. The members, names, and header all come as separate decals on occasion. See this video for help lining up your decals as you apply. Applied to outside of a surface or glass. The decals are applied to the outside. The decals are applied to the outside only. Get the decal in one color of any color. Special colors cost a little extra. The color family member's color can be changed upon request. The names and header comes in any of our regular die cut vinyl colors. No extra charge for any size between 3.5 - 5.5 inches. Just let me know you want the size changed when you approve your emailed sample proof. You can choose a size before adding you creation to cart. Size can be from 3.5 - 6 inches for the largest member. Price calculated automatically when you select a size. *Prices include any regular color. Special colors are extra. Your total price will be calculated automatically by the program. So design it and have fun! Members cost from $2.50 to $5 depending on size you choose for the set. Ordering only 1-3 members costs a little extra. Once you approve your emailed sample the order is usually made and shipped the same or next day. Once you approve your emailed sample the order is usually made and shipped within 2 days. A few examples of some family stickers that can be made here! Each family decal is tideously "weeded" out by hand for a product you can't get from a production line. The family sticker looks more unique than printed bumper sticker style decals. A mirror and give it as a gift! A welcome entry to your home! Cut apart and put one on each window of vehicle where that member sits. 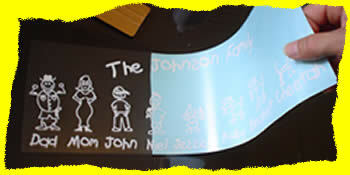 We have VERY Affordable Pricing of the Family Decals. after 6 Members only $2 each! *Prices include any regular color. Header text above sticker $.10 per letter. Names below family members $.05 per letter. 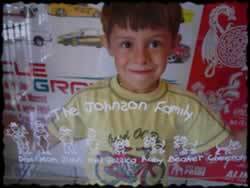 READY TO CREATE Your Family Sticker? If your not good with a computer don't worry. It's really easy. Click here to go ahead and give it a try ...It's FUN too!